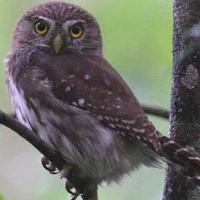 Ridgway's Pygmy Owl is a very small owl with no ear-tufts and a rounded head. 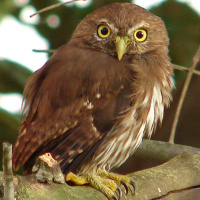 Size and colour are quite variable, with grey-brown and red morphs known, as well as intermediates. Typical call - Southern Arizona, USA. © Doug Von Gausig. Description: Greyish-brown morph: The facial disc is pale brown, flecked whitish, with whitish eyebrows. Eyes are pale yellow, cere and bill are greenish-yellow. Forehead and crown are densely streaked pale buff to whitish. The nape has false eyes edged in pale buff. The mantle is slightly darker than the crown, irregularly spotted whitish-buff. 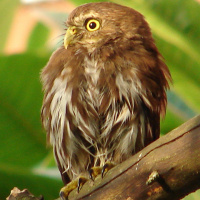 Upperparts are greyish-brown. 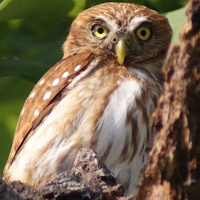 Wing coverts are barred light and dark, with the outer webs of the scapulars having large whitish areas forming a row of spots across the shoulder. The flight feathers are incompletely barred pale and dark, while other feathers are dark greyish-brown with whitish-buff spots on both webs. The tail is dark brown with 6-8 rufous, ochre or whitish-buff bars. There is an off-white throat patch, and the sides of the upper breast are greyish-brown with buffish streaks and spots. The rest of the upperparts are boldly streaked brown or greyish brown. Tarsi are feathered, and yellowish toes are bristled. Claws are dusky horn with blackish tips. Red morph: Pattern is similar to above, but general colouration is rufous to orange-brown. The tail is always barred rufous. Size: Length 17-19cm. Wing length 81-113mm. Tail length 53-79mm. Weight 46-102g. Females are larger and heavier than males. 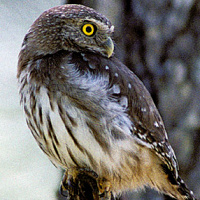 Habits: The Ridgway's Pygmy Owl is partly diurnal, but mostly active and dusk and dawn, and sometimes active at night. They are generally hidden in foliage during the day, but sometimes seen on an exposed perch in the bright sunshine. Often perches on top of giant cacti in semi-deserts. Flight over distance is mostly straight, with rapid wingbeats alternating with gliding. Voice: The Male's song consists of a long series of equally spaced notes (2.5-3 per second) with a somewhat hollow bell-like ringing character - poip-poip-poip-poip-poip... Phrases may comprise of up to 30 notes, or more if excited. The phrases are repeated after a several second interval. 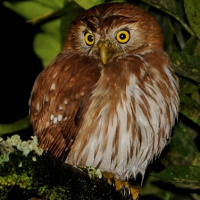 In addition, the Ridgway's Pygmy Owl gives a faster and more insistent whi-whi-whi..., breaking into bursts of high, yelping twittering. Also gives irregular, short series of single notes, as well as series of chuck notes (about 2 per second), and repeated khiu notes. 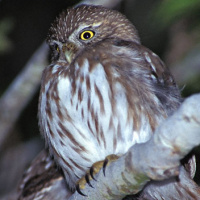 Hunting & Food: The Ridgway's Pygmy Owl eats mostly insects, small birds, small reptiles and small mammals. Prey can sometimes be as heavy as the owl itself! Forages at medium height in wooded areas, or in bushes near the ground. Prey is normally caught from a perch, or in dashing flight into thickets or dense foliage. 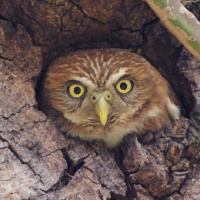 Breeding: The breeding season for this owl is normally March to June, generally during the dry season and beginning of the rainy season. Nests in woodpecker holes in trees or giant cacti, or sometimes in opened nests of termites in trees. The female lays 2-5 (usually 3) white eggs measuring an average of 28.5 x 23.3mm and weighing 8-8.3g. The eggs are incubated by the female alone for 22-30 days while the male supplies the food. Chicks fledge at around 27days after hatching, and are cared for by both parents for another 3 weeks or more. Habitat: Semi-open areas with thorny scrub and giant cacti, scattered patches of woodlands in open terrain, plantations; open, mostly dry woods and evergreen secondary growth. Ranges from sea-level up to about 1500m. 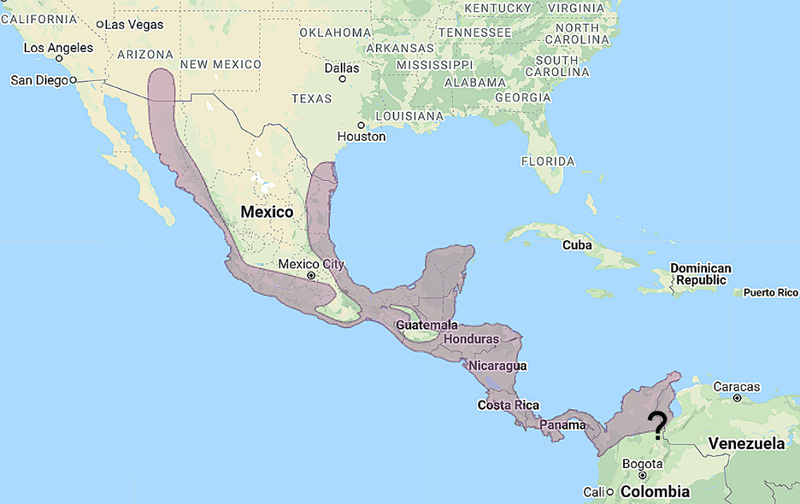 Distribution: Southwest USA to Mexico, from Sonora and Tamaulípas south to Panama and perhaps to extreme Northwest South America. Original Description: Sharpe, Richard Bowdler. 1875. Ibis, 3rd Series, vol. 5: p. 55, in text. Based on: Ridgway. 1873. Proceedings of the Boston Society of Natural History16: p. 93. 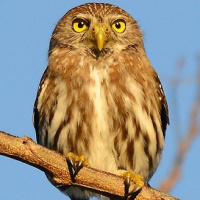 See also: Other owls from North America, Central America, South America, Genus: Glaucidium.